Pesto is easily acquired by buying one of those 8 oz. tubs in the grocery store. But it's so easy to make. Just six ingredients. I'll admit to being lazy and buying it, but it's so much better made fresh. Fot the pasta dish pictured, I tossed pesto with farfalle and leftover ingredients from the fridge: Italian sausage and pepperoni left over from a recent pizza, the latter sliced into ribbons, and some teardrop and grape tomatoes. Our enjoyment of this pasta was perhaps disproportionate to the effort that went into it. It was really quite delicious. 1. Cook pasta according to package directions for al dente. Drain and set aside. 2. Heat olive oil in a medium saucepan over medium heat. Add garlic and cook until softened. Stir in the cut tomatoes and pepperoni and cook until the tomatoes have softened a bit, but not fallen apart, about 5 minutes. 3. 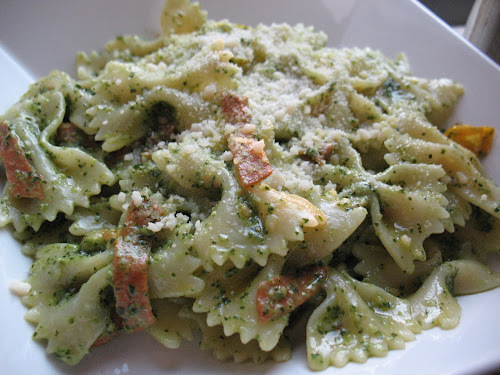 Toss the cooked pasta with the tomato sauce, pesto and black pepper. Serve with additional parmesan cheese. It was very delicious! Who knew great pasta could be made so easily? 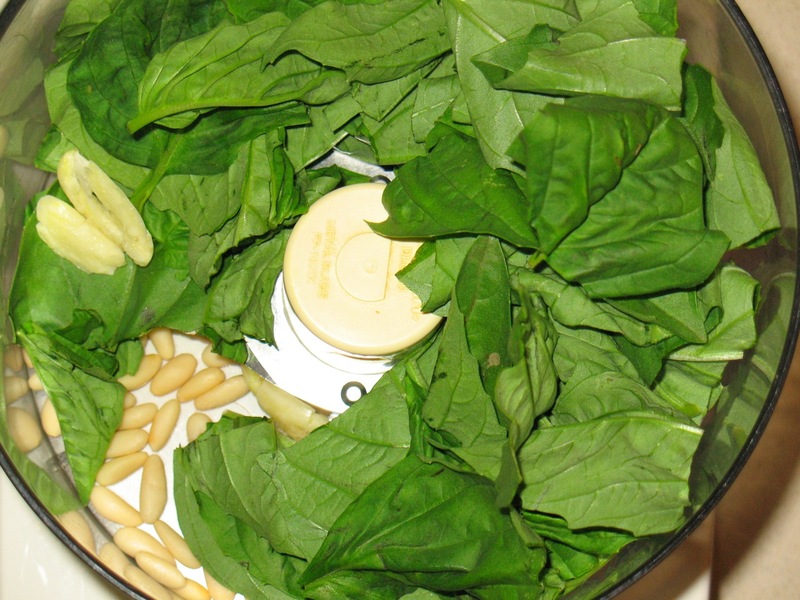 Pesto is really easy to make. If you can get fresh basil and good parmesan, it's so much better than getting it in a tub.